I’ve been interested in weaving for a very long time. I took a course while living in North Carolina about 25 years ago and wove a baby blanket in an interesting pattern. Since then I’ve really wanted to get a floor loom so that I can weave my own fabric and throws and blankets and things. Sadly they are expensive and take up a lot of room and weaving isn’t the kind of thing that you can do while on a bus or a train, so I have never gotten around to doing that. I recently sewed a medieval costume for Victoria (11) and realized that it needed a bit of border material to spruce it up. I had some commercially made border that I had purchased some years ago at a medieval fair and used that, but it really isn’t “period”, as the material is commercially made by machine. Real die-hard fans would have used a hand-woven border. That’s when it hit me, that I could get a small loom and weave border material and belts and scarves and things. This wouldn’t take up as much floor space as a full-sized floor loom, but would allow me to indulge my interest in weaving. Research on the Internet led me to Jens Neumann’s Brettchenweber Shop. 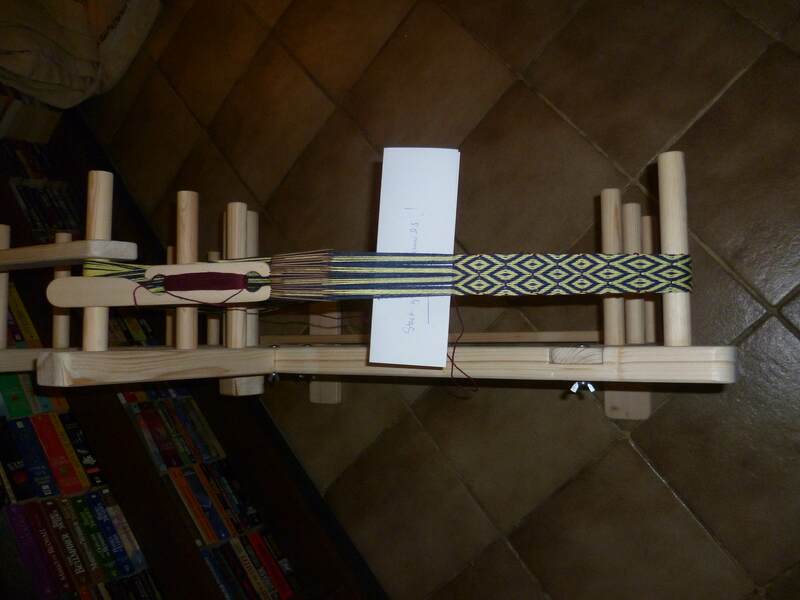 I ordered the large loom for 99,- EUR and some handmade wooden tablets. 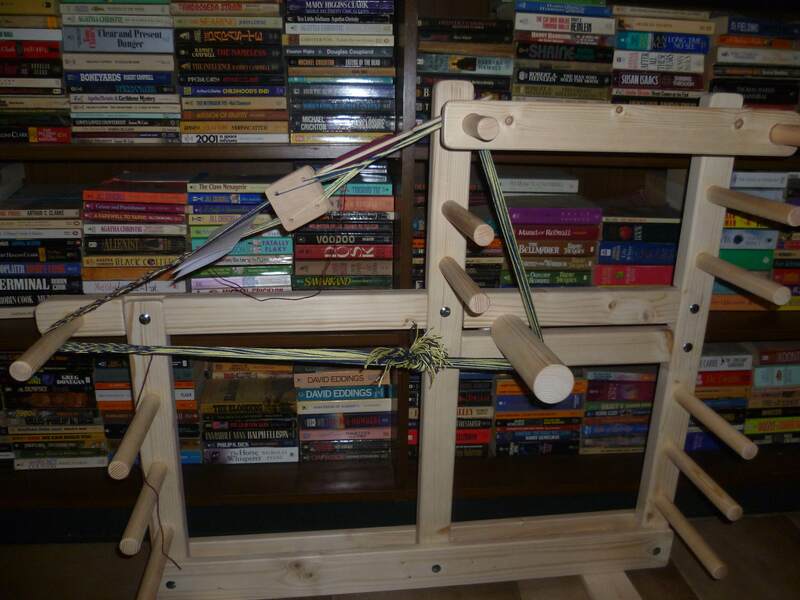 The loom arrived the other day and we quickly put it together (his detailed illustrated instructions were easy to follow). Since I had never done any tablet weaving before I needed to find some instructions on the Internet, which I sorta-kinda thought I understood, then found some heavy linen yarn that I’ve had sitting around waiting to be used in a weaving project, then I found an interesting (but not too complicated) pattern for tablet weaving, and Victoria and I got to work. 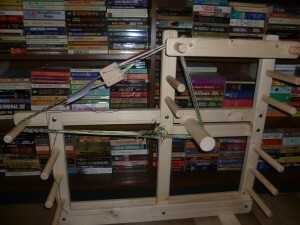 We wound the warp, labeled and threaded the tablets, set up the loom and got to work. 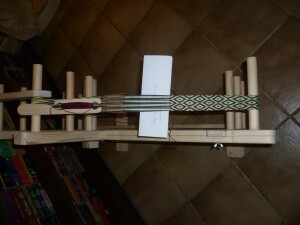 In this photo you can see the loom, warped with tablets threaded. As this was our first project, we just put the minimum amount of warp yarn on the loom so we could get a feel for the loom, the tablets and see how the pattern worked. We probably have about one and a half meters of warp length here (80 threads total on 20 tablets). The loom itself is about 1m long and 80cm high and can hold about 8,5 meters of warp. For illustrative purposes we used a dark red weft thread (normally you would use something the same color as one of the warp threads), so that we could see where it peeks out. In tablet weaving, usually you only see the weft thread at the edges, but it was a good thing we did that since we can now see a few other places where it shows through. It didn’t take long for both Victoria and I to get completely hooked. The work is fun, it goes relatively quickly, and you can see results after the first few shots of the weft. The tablets are a dream: the wood feels good in the hand, they turn without much effort and they don’t pinch or fray the yarn. You can see that the beginning of the band (on the right) is a bit thinner and the pattern is a bit more stretched out. This is because it took us a little while to figure out the correct tension of the weft and how hard to beat. This project was meant as a test project anyway. All in all, it looks like this will be great fun and should get a lot of use this winter. I’ll probably add some more to this post later, but wanted to put up the pictures and figured it needed some explanation.